Patrick is a California native, born in Arcadia. Patrick may only be in his thirties, but he’s already a veteran performer in old-time, bluegrass, folk, western, and other musical genres. His first musical influence was his dad; old time master fiddler and claw-hammer banjo player, Tom Sauber, whom he still performs with often. Patrick also travels a lot with other groups like Laurie Lewis, John Reischman, Peter Rowan, and John Jorgensen. Like the other fellas in The Brombies, he travels a lot on weekends, then slides into town for The Brombies’ Monday night gig. 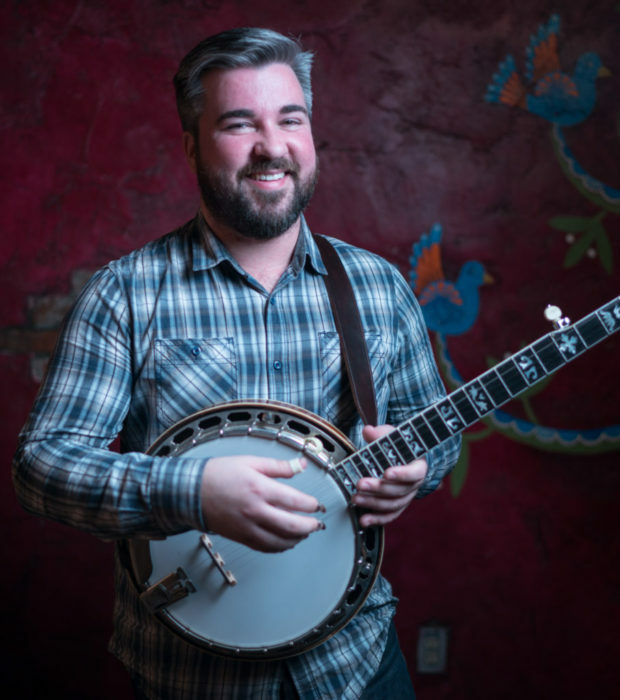 Patrick’s banjo playing creates an energy that is powerful and exciting, but he’s also just as great on the mandolin, guitar and cajun accordion. Yep, accordion. Recently, Patrick was part of a CD tribute recording to honor Hazel Dickens and Alice Gerrard. Patrick played with Laurie Lewis; the CD was nominated for a Grammy. Patrick has been a member of The Brombies for nine years. That’s almost from the beginning. Bill Bryson has known Patrick since he was born and we are very thankful that he introduced us to Patrick and suggested we might like to have him playing with us. Bill sure was right! Patrick’s been with us since then. Thank you Bill.